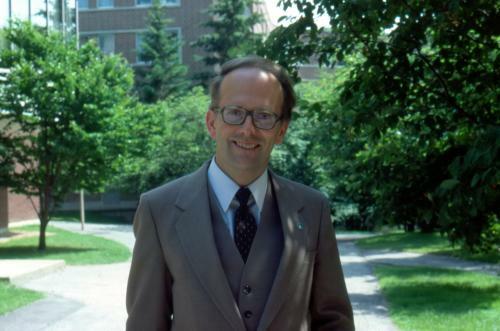 ROY L. BISHOP (1939-) teaches Physics at Acadia University in Wolfville, Nova Scotia, where his family roots go back for more than two centuries. During the '60s, he was away from Nova Scotia earning his M.Sc. from McMaster and his Ph.D. from the University of Manitoba, both in nuclear physics. Roy Bishop's first contact with the RASC was with the Winnipeg Centre but, after returning to Acadia, he joined the newly re-established Halifax Centre in 1970. He contributed greatly to the Centre, speaking nearly every year at least once, serving as President in 1975-76 and as Secretary and National Council Representative. Some idea of Dr. Bishop's wide interests can be seen from the titles of his talks which cover optics, the rainbow, illusions, SS433, tidal power, and many historical topics. His research on early observatories in Nova Scotia led to his election to the IAU in 1982. At his Maktomkus Observatory at his home, using a mirror he produced himself, he has become an expert visual observer of evething from the Moon to deep-sky objects. As a teacher of introductory astronomy courses at Acadia, he has introduced a number of innovations including a set of conveniently mounted erect-image telescopes for student use. As a highly respected administrator, he has headed the department of Physics at Acadia for four three-year terms. The Society continues to benefit from his many talents. He has been a valued member of the Constitution Committee, chaired the Historical Committee, been through the ten-year cycle of Presidential offices, and served as the Editor of Education Notes for the Journal since 1982 and of the Observer's Handbook since 1981. Roy Bishop received the Service Award in 1988. Displaying 1 - 4 of 11 items (page 1 of 3).